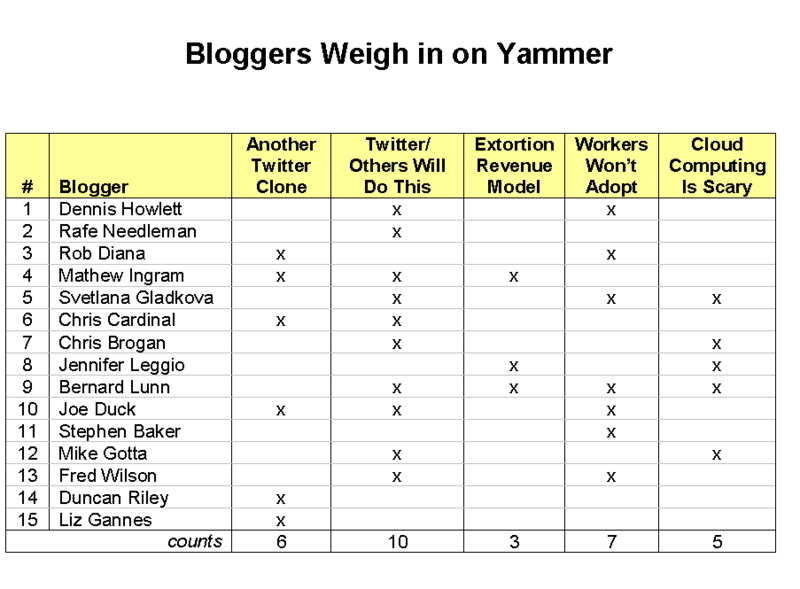 20 Responses to Yammer Gets Bronx Cheers from the Blogosphere. Why? Let me clarify my post a bit. I have no problem with what Yammer is doing, and adoption in the enterprise will be difficult. My issue was more with Yammer winning the TC50. Saying they were the best of the bunch was a stretch, but that does not mean they won’t be successful. I think a majority of the “Yammer negativity” has been centered around the award, not Yammer the service. And not listed is how it was ‘best in show’ at a conference of innovative startups. Which is kinda sad that out of all the really innovative apps, a twitter client was the best. Excellent post Hutch. I think the reviewers saw this as one of the few very practical applications, though I remain skeptical this can’t easily be outdone by Twitter. For example two CNN anchors have caught the Twitter bug now and brought it into mainstream parlance. There is little chance they’ll be switching..
Eric – the “Another Twitter clone” reason really speaks to the “lack of innovation” reaction. Thanks Joe. Twitter definitely has paved the way for the value proposition, so I see what you’re saying about judges’ reaction. Twitter is slowly leaking into the mainstream conscious with CNN usages and stories by the mainstream media. I’m still not convinced they’ll be addressing the enterprise market yet, just because the requirements there are so much more than out on the consumer web. Good post – agree with your points. Another thing in Yammer’s favour – they have the most pro-active help I have ever seen. They actually watch Twitter, and respond directly. I have never seen either an Enterprise or Consumer vendor do this! See my latest post on Yammer. Great post Hutch. I really did scratch my head when they were announced as the TC50 winner. Twitter has paid some serious dues with regards to scaling issues and when they decide that enterprise is their next target will be a major force. Your article has me wanting to take another look at Yammer though- perhaps I’m still missing something. Regardless of the TC50 thing, most of the author’s observations are pretty much on the money. With ESME we’ve gone after the juggernaut – or should I say jugular – that is SAP. It makes a huge amount of sense to win the backing of developers in that world because that’s the company that touches 50% of the world’s enterprise systems. ChookyDoro – dunno. I picked it from the wordpress.com templates. Reading this blog post again a year after it was written. Still a great piece. Interesting to see how after a year Enterprise Microblogging has already moved from Technology Trigger into the Trough of Disillusionment. Please preserve publishing your articles are Very good.